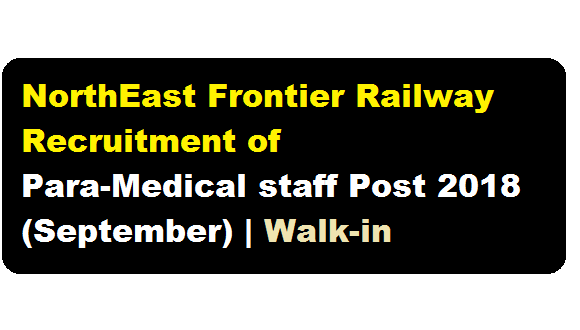 NorthEast Frontier Railway Recruitment 2018 for Para-Medical Staff Positions in September :- Few days ago we have informed you about NFR Railway Jansadharn Ticket Booking Sewak recruitment. Today we will inform you about another new Recruitment 2018 notification of NF Railway. According to the Latest Northeast Frontier Railway Recruitment 2018 September (Second), A walk-in interview will be held on 27th September 2018 at CMS office, Alipurduar Jn. Rly. Hospital for engagement of PARA-MEDICAL STAFF on contract basis. More details of this Latest NFR Vacancy can be found in the following section. In this section, we will discuss in details about the recruitment of Para-Medical staff under NorthEast Frontier Railway September 2018 recruitment with vacancy details, eligibility criteria, salary with other details and requirement. Number of posts : One (01), Unreserved. Pay : Rs. 29,200/- (Level-5) plus usual allowances. Eligibility Criteria :- Candidates must have done 10+2 with Physics & Chemistry and Diploma in Radiography/X-Ray Technician/Radio-diagnosis Technology (2 years course) from recognised Institution. Science Graduate with Diploma in Radiography/X-Ray Technician/Radio diagnosis Technology (2 years course) along with experience in digital X-Ray shall be preferred. Age Limit : 18 to 33 yrs as on 01-09-2018, Upper age relaxation for SC/ST = 5 yrs and 3 yrs for OBC. Date & time of interview : 27-09-2018 at 10.00 hrs. Interested and eligible candidates may report for the “WALK-IN-INTERVIEW” as per date and time specified above with copies of all certificates/ testimonials/mark sheets in original and true copies (attested by a Gazetted officer) and also 2 (two) recent pass port size photographs along with a filled in application form to the venue of CMS office, Alipurduar Jn. Railway Hospital. Divisional Railway Manager (P), Alipurduar Jn. Detailed notification is available at www.nfr.indianrailways.gov.in (general info-departments-personnel-walk in interview).